Today’s guest post is by Adam Ghering, public affairs specialist with the U.S Department of Agriculture’s Food Safety and Inspection Service. 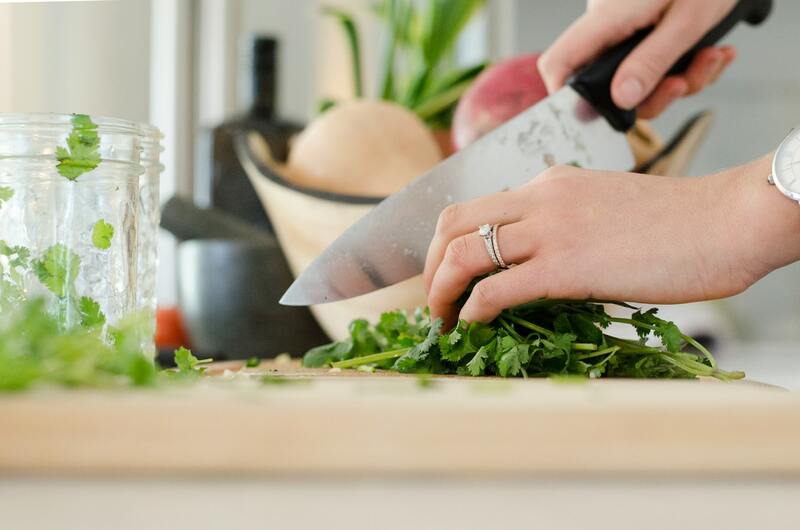 As National Public Health Week approaches and we work to become the “healthiest nation in one generation,” we can all practice simple food safety steps to prevent illness. For starters, following the four steps of food safety anytime we handle, prepare or eat foods can help. wash hands for 20 seconds before handling foods. • Separate: Use separate cutting boards, plates and utensils to avoid cross-contamination between raw meat and poultry and ready to eat foods. • Cook: Confirm meat and poultry are done — Don’t just guess! — by using a food thermometer to verify they have reached a safe internal temperature. How can we combine these food safety steps with other healthy activities? Maybe you have made a goal to eat more fruit, vegetables and lean meats. Great! But don’t forget to wash those fruits and vegetables before peeling or eating. On the other hand, don’t wash raw meat and poultry before cooking, as washing can cause cross-contamination of bacteria through your kitchen. If you are trying to save money and eat healthy by preparing multiple meals in advance of your work week, remember that once foods are cooked, they need to be refrigerated within two hours, or within one hour if the temperature is 90 degrees or above. The best way to quickly cool foods is to place them in small shallow containers and then into the refrigerator. Leftovers in your refrigerator are good for three to four days. When reheating, make sure the food reaches 165 degrees, as measured by a food thermometer for maximum safety. If you don’t use those leftovers in three to four days, you should freeze or dispose of them. Foods in the freezer should be consumed within two to three months if they contain meat, and within one to two months if they don’t contain meat. These freezer storage times are for best quality, and frozen foods are safe indefinitely. Need more food safety information? Call the USDA Meat and Poultry Hotline at 1-888-674-6854 Monday through Friday, from 10 a.m. to 6 p.m. ET, or email or chat at AskKaren.gov. Have a healthy National Public Health Week! Resiliency. You fall, get back up and continue on with your day. But communities, not just individuals, also need to be resilient. Recent hurricanes, wildfires and other disasters have reminded us that community resiliency plays a role in keeping neighborhoods and cities healthy, happy and safe. Community resilience is “the sustained ability of communities to withstand, adapt to and recover from adversity,” according to the U.S. Department of Health and Human Services. If a community can build itself back up after a disaster, life is better for the people there. Connect with people in your community. Get to know your neighbors! Build relationships with the people around you. Learn new skills or use what you already know. If you can cook, you can help feed your neighbors in an emergency. If you can drive, you can drive people to safe locations. Understand your community and its goals. Think about possible weaknesses your community may have and work together to strengthen them so when disaster hits, you’re ready. Take action: Even if it seems tough, make a decision and stick with it. Think positively: Trust in your ability to solve issues. Keep things in perspective: In the long run, things may not be as big of a deal as you think. Self-care. Engage in healthy activities that you find enjoyable. Eat well, sleep well, play well. Encourage your neighbors to live a healthy lifestyle, stay informed and be prepared. You can only bounce back if you’ve planned ahead. For more information on how to build community resilience, check out this great toolkit from Rand. Are your pets ready for a disaster? Now’s the time to get them in shape! We’re not asking you to put your pets through boot camp and run them through escape routes. But before a disaster hits, it’s important that you — the one who loves them the most — come up with food, transportation and shelter options for your pets. That last one can be especially important to think about in advance. According to research in APHA’s American Journal of Public Health, when disasters hit, some pet owners find it difficult to find shelters that accommodate pets. Sometimes that means that people stay behind when they shouldn’t, risking the lives of both themselves and their pets. During Hurricane Katrina in New Orleans, for example, almost half of people who refused to evacuate did so at least partially because they wouldn’t leave their pets, the AJPH study noted. And it’s not just the general public that’s affected. As many as a third of health workers may be unable to work during a disaster if they don’t have a safe place for their pets, research shows. However, if you locate pet-friendly places to go before a disaster, you can increase your ability to find a safe place for you and your pets to go when needed. 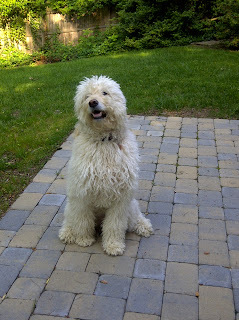 You can find directories of pet-friendly hotels online. Print out a list of those in your local evacuation area and keep it in your supplies. Home-sharing services with pet-friendly options, such as Airbnb, are another option to keep in mind. Some public shelters accept pets as well. To find out if there is a pet-friendly shelter near you, contact your local animal shelter or emergency management office. Pet owners should also prep an evacuation kit, sometimes called a “go-bag.” Include three days’ worth of food and water, garbage bags for clean ups, a leash, a first-aid kit, a crate or other pet carrier and a litter box and poop bags. Don’t forget toys, blankets and pet beds. Pack so your pet will be comfortable during an emergency. It’s also important to have copies of your pet’s vaccination and medical records. By planning ahead, you can protect your pet and yourself, too. For more tips, check out our fact sheet. A huge water main break occurred in Atlanta this week that left many residents with very little water. Neighborhoods and major highways were flooded, and officials issued a boil water notice for everyone who uses the county water system. Children were sent home from school and businesses shut down — including Emory University, the Dekalb County Board of Health and the Centers for Disease Control and Prevention campuses. Water main breaks can happen any time and without notice. Which may leave you wondering what to do if this happened in your community. First, it’s important that you are signed up for emergency alerts for your community. You don’t want to find out that you’re not supposed to be drinking water after finishing off a big glass. Updates are happening every minute and you wouldn’t want to miss them. Don’t start using the water again until you have heard the all-clear from a community official. 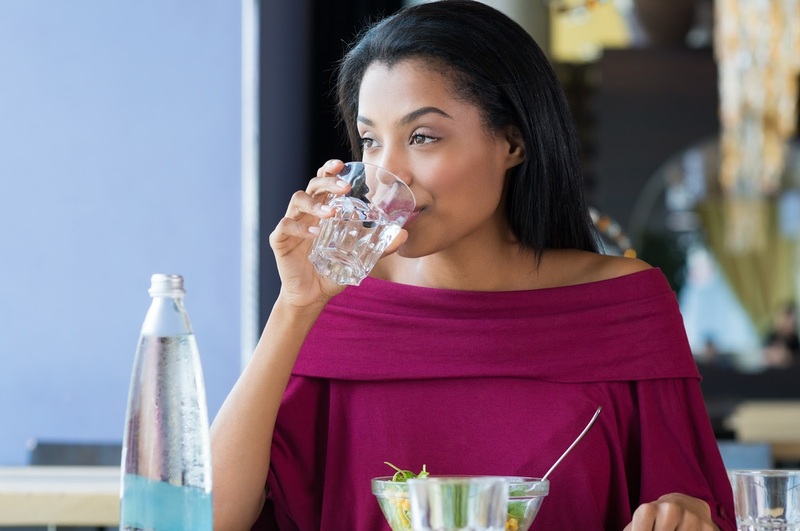 That’s because water can be contaminated with harmful bacteria and other substances that can make you sick. Boil your water if told to. To correctly boil your water, bring your tap water to a rolling boil for one minute and then set it aside to cool down. Watch out for flooding. The water main break in Atlanta caused major flooding, reaching cars and buildings. Remember to stay away from flooded areas. If you are driving and encounter a flood, turn around. It is extremely important that you never drive through flood water. Create a water stockpile. 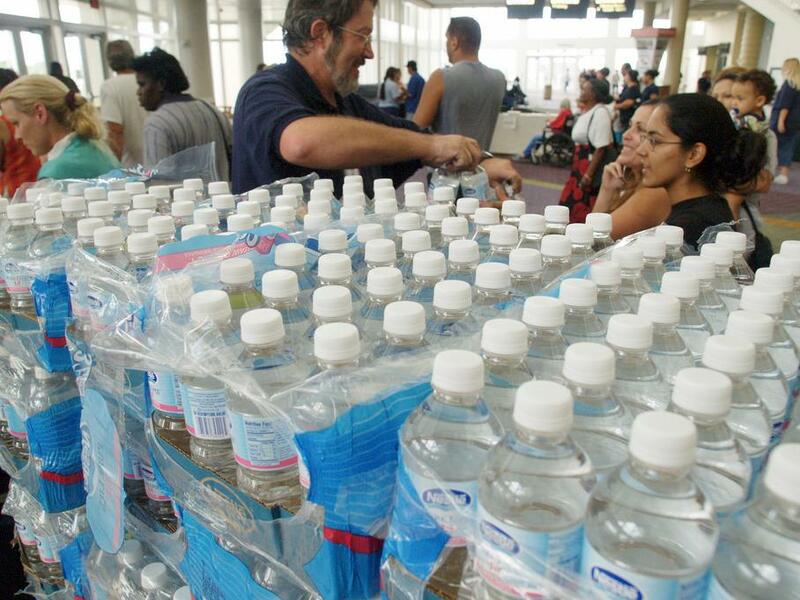 Every U.S. home should have a three-day supply of water stored, with one gallon of water per person per day. This water will come in handy when you need to flush the toilet, wash the dishes, brush your teeth, wash your hands and feed your pets. If a water main break can disrupt activities at CDC — our nation’s leading public health and preparedness agency — imagine the problems it can create for unsuspecting families and businesses. Spring is almost here and so is daylight saving time. 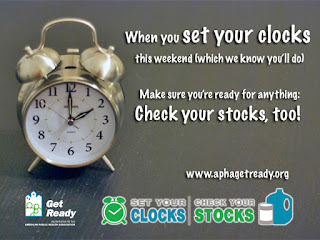 And you know what that means: Time to set your clocks and check your stocks! When you change your clocks March 11 — or when they change themselves, as so many of our electronic devices do these days — use it as a reminder to update your emergency stockpile. That way you won’t be caught in a bind when an emergency happens. 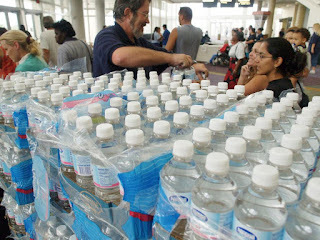 There are lots of things you should have in your stockpile, such as water, batteries and first-aid supplies. We have awesome lists and fact sheets on our website that show you everything you need and why you need to update it. But today we’re going to talk about one particular thing you need: An emergency food supply. Preparedness experts recommend having at least a three-day supply of nonperishable food. Here’s why. Disasters often strike with little to no warning. You may not be able to run out to the store, and if you do there could be huge lines and frantic shoppers. It’s better for your peace of mind and safety to have your food supply ready and waiting at home. Choose foods that your family likes to eat. If your family hates pea soup normally, they won’t want to eat it while sheltering in place either. Avoid foods that are salty, as they will make you thirsty. Ensure that the foods you stockpile don’t need to be refrigerated. Soups, pudding, peanut butter, shelf-stable milk, granola bars and cereal are all good ideas. Buy food that is ready to eat or needs little preparation. Keep in mind your power may be out and you may not be able to heat things up or wash dishes. Look for canned fruit packed in water or fruit juice, not syrup. Don’t forget food for your family members with special needs, such as infants, seniors and pets. Make sure to pack a manual can opener! It’s smart to think ahead and imagine what dining from your stockpile will be like. What items will you wish you had on hand? Our stockpiling recipes and disaster cookbook can give you some great ideas. Print out our shopping list before you head to the store. For more tips on what to include in your emergency supplies, check out our website.